Visit us at the IISF Tradeshow this week at the Showman’s Club. On display: custom bunkhouses, an eye-catching guest services unit, and our built-to-last-a-lifetime benches with custom signage. See you there! Bob and Debbie Pugh’s custom bunkhouse includes a comfortable, spacious, and simply beautiful mother-in-law suite complete with a full bath. Also, be sure to take a look at the floor plan. Come see our bunkhouses, benches, and ticket boxes at the IISF tradeshow in Gibsonton this week through Saturday. Check out this heavy-duty, fifth wheel, cargo trailer with side and rear access, including a rear ramp, built for Carolina ATM. Carolina ATM is the premier full-service ATM provider in the United States — placing, operating and servicing ATMs throughout the country. Based in Raleigh, North Carolina, they offer superior customer service, quality, and innovation at affordable prices. 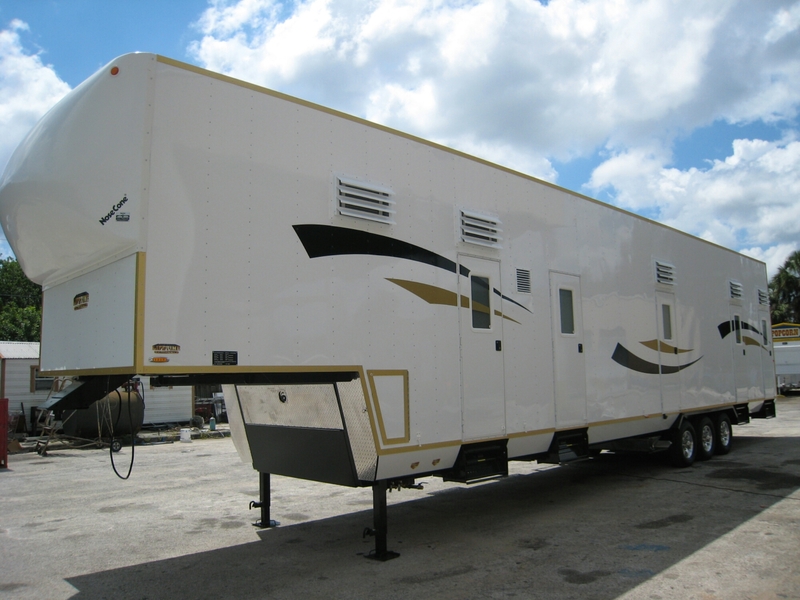 Superior service, quality, and innovation – it’s no wonder they chose a Lifetime trailer! Thanks to Carolina ATM for this purchase!